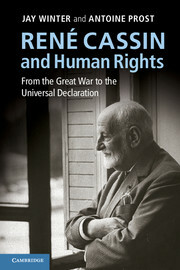 Jay Winter, Charles J. Stille Professor of History at Yale University, and Antoine Prost, Professor Emeritus at the University of Paris I Panthéon-Sorbonne, have published their new book on René Cassin and Human Rights. From the Great War to the Universal Declaration, (originally published in French in 2011). Both authors are investigating the emergence of the international human rights regime through the lens of one of its supposed major protagonists. They focusing on the life of the prominent French jurist and diplomat René Cassin (1887-1976), who received the Nobel Peace Prize in 1968 for his renowned human rights commitment. By examining the biography of this prominent figure Winter and Prost seek to show what human rights meant to a generation that experienced two World Wars and how these experiences shaped the Universal Declaration of Human Rights in 1948. Approaching the history of human rights through the prism of an individual’s life both authors claim to add a “third approach” ( p. xix) to the existing literature: “This biography is a history of the struggle for human rights in a specific time and place. We offer a different chronology and a compromise between those who see human rights as advancing in a glacial manner in a cumulative or additive process of gains and losses, and those who see it in terms of truncated evolution, with a radical break at a specific point in time” (p. xix). This entry was posted in Actualités / News, Books, Reviews and tagged Human Rights, René Cassin by Fabian Klose. Bookmark the permalink.